Eco-Evo Evo-Eco: I spent WHAT? Journals today are much maligned. We all want to publish our work for free, and read papers without paywalls. Many of us also want to have nicely typeset and carefully copyedited articles. These are incompatible goals. Until we get governments that fund all journals' expenses (good luck with that!) or we get a Paul Allen or Howard Hughes to fund publication (ditto! ), we need to make two choices. 1) Do we want the value that journal editorial staff add to the production of a snazzy final version? Journals provide website support, database management, and staff that enable careful anonymous peer review. They provide copyediting that (*if done well*) catches errors (rather than introduces them) and improves the final product, and typesetting that makes it all look good. And, if you publish in a traditional print journal they put it on nice archival paper so it'll still be readable after the Zombie Apocalypse, unlike those e-articles that'll be forever lost. For more detail on the value added by journal office work, see this previous blog post of mine on "The Secret Lives of Manuscripts". 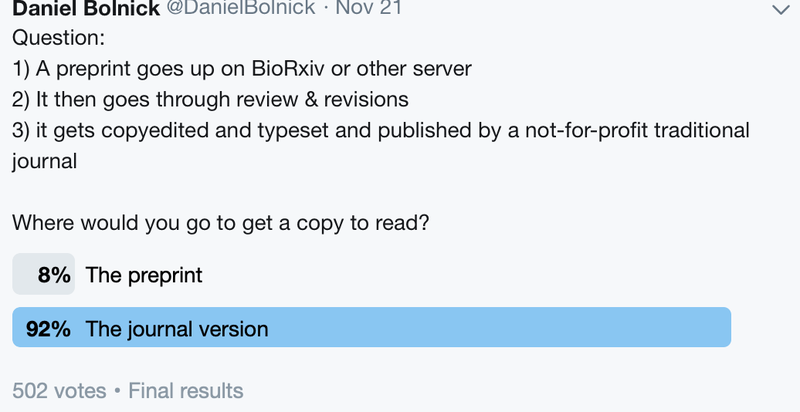 I did a very informal (e.g., unscientific) twitter poll on this question: of 500 respondents to my (certainly poorly worded) question, 92% prefer the typeset journal version. The other 8% were all named Andy Kern, I think (kidding). Today on twitter, my grad school friend Andy Kern suggested maybe we need a hybrid approach where authors can choose to pay for all these services, or can have their raw manuscript posted. Interesting idea. I wonder how many authors would opt to pay for the services. And, would the decision have any impact on how widely our papers are read and, eventually cited? I don't know. 2) If the answer to (1) is yes, then who pays for the value that journals add and that we desire? There's a lot written about this, and disparate strongly held opinions. Both have their drawbacks: author open access fees can pose insurmountable barriers to low-funded labs or students (*A STORY ABOUT THIS AT THE END*). Traditional journals can be inconvenient to access: if you don't have an institutional subscription access you either need to pay (few people do), or contact the author (long lag times or no answer), or go to SciHub, or read another article entirely. I'm not going to delve into that here. There be dragons. Instead of tackling those dragons head-on, I want to address a point that Andy Kern raised in our twitter conversation today. 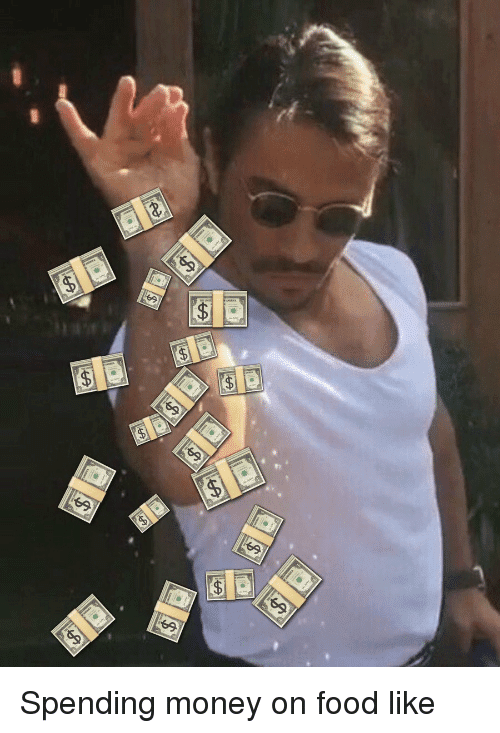 He pointed out that I had published 8 papers in 2018, and estimated I probably spent $20,000 on the page charges (2500 per article) plus the indirect costs my university charges on those expenses for a total of (he estimated) $40,000. What, Andy asked, could I have done with that money instead? It is a fair question. I always budget for some page charges, but I had never specifically tallied up my page charge total across all grants and projects. So, that's what I did. The table below shows all my papers from 2014-2018 (a 5 year period), where they were published, who paid, and how much. I should note (before you read the table too closely) that I couldn't find all of my page charge invoices from the whole 5 year period, having switched computers twice in that interval. So some of the numbers are estimates derived from the journal websites. Others (marked with asterisks) are from memory because I know the APCs (Author Page Charges) were lower a few years ago than the websites indicate today. The 46 articles listed above added up to a whopping $35,115 over a five year period (of which I paid $32,315 plus roughly 56% overhead for a total of $50,411. That's $10,000 per year. Ouch. But let's put this into some perspective. First, I have been exceptionally lucky to be well- and continuously funded. For much of the time period covered here I was supported by the Howard Hughes Medical Institute, which paid for open access fees. Come to think of it (as I write this), my 2014 & 2015 papers with $0 APCs were probably wrong, as I almost certainly had HHMI pay for open access fees. That lifts up my per-article average and 5-year total above what I report here, but I don't have the details on hand. That said, the open access fees mandated by HHMI didn't come out of my research budget, but out of separate HHMI funds. That supplemental publication funding disappeared in 2016 and after, when I ceased to be an HHMI Early Career Scientist (but was still publishing work from my HHMI time). So, the grand total listed above is a lot, and is an underestimate, but I actually paid less than what is listed above (thanks Uncle Hughes!) and it was a modest fraction of my very generous HHMI funding. The point is, there were just a couple of boutique journals that charged an arm and a leg. All were open access and for-profit. Then there is a set of mid-range articles that were expensive, but between $1500 and $2000 (usually closer to 1500), mostly society open access journals. But the majority of my publications cost under $1000 each. A number of journals were free of page charges, because they gain all their income to cover expenses from subscriptions. Some readers I know will object, but given my research output it was frankly either that or not publish these papers at all, if I can't afford to pay OA fees for them all. Maybe some of you will suggest I take that latter approach, in which case see that story at the end, which I promised (in all caps) up above. Let's return now to Andy's radical suggestion: what if we lived in a world where we skipped copyediting and typesetting and distribution and archiving, and we just posted our (reviewed and revised, I hope) manuscripts on servers. Its then up to us to format our papers, proofread them super carefully, and typeset them as best we can. An interesting notion. I would have saved roughly $50,000 over the last five years. Save that up and its a year of graduate student support, or a year of postdoc salary (but not enough for fringe & overhead on that salary). Tempting. So what's the downside? First, I'd need to learn how LaTeX or something to make my manuscripts look better. Second, the copyeditors at (some of) the journals I publish in are excellent and help nit-pick to fix the last few items in every paper that I inevitably miss. That's an expensive service. To put it another way, my cumulative output of scientific writing in the last 5 years is well over 500 pages. That's a long book. If I were to copyedit that myself, and typeset that myself... ugh. I'd pay for a professional (again, I know some journals' copy editors are know for messing things up more than they help, but that's not always true. This is where I make a plug for AmNat's excellent team). As an Editor I can also attest to the fact that many manuscripts come in poorly written and in desperate need of copyediting, more than the reviewers and Associate Editors and I have time to do. So I have a pretty good idea of what the scientific literature would look like if we all skipped these (costly) services, and it's not pretty. Copyediting is especially valuable to authors for whom English is a second (or third, or...) language. We do sometimes have articles that are excellent science but need a fair bit of word smithing to be up to standards. So, my conclusion? I'm really torn about this. Once I added it all up, I've spent a lot on publication in the last half decade. That's paying for a service I appreciate and value (especially because I see the process from the journal perspective as well). But, its a lot of money. Considering the cumulative totals I am spending, there's more science I could do with that money. But, doing all the copyediting and typesetting in house takes us away from doing science. And there's still the issue of archiving on paper for the Zombie Apocalypse. Now that I've seen the totals I am spending, I will certainly choose my target journals even more carefully based on financial and policy concerns, which is a shame because it steps away from my scientific ideals. And maybe I'll hesitate about that extra little paper, and wonder 'is it worth the APCs to write this'? I promised you a closing story, so here it is. 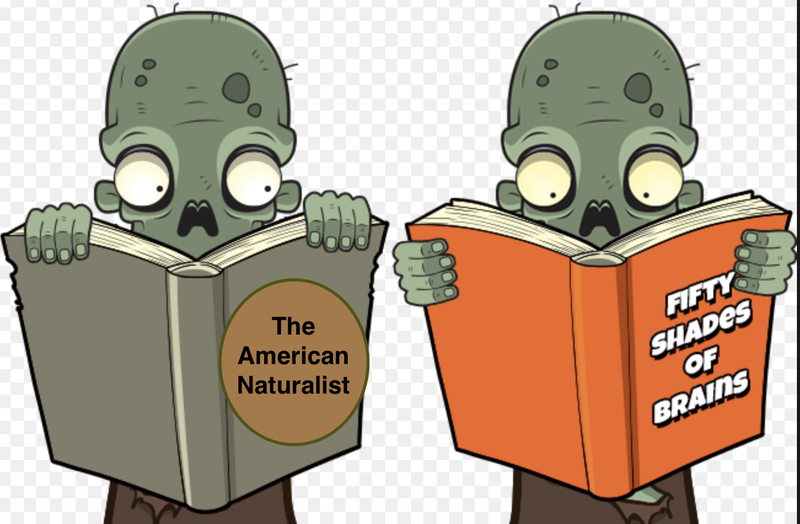 When I was a graduate student some friends and I got together to discuss some papers we read together, and it turned into a reading group and a Synthesis paper (Bolnick et al 2003, American Naturalist). It was an all-student group of authors, self-organized, with no funding. When we finally got it accepted (after 2 revisions, at least), we reckoned with the cost of publication. It had become a really long paper with extensive tables. I was an ASN member, which got me 10 (?) free pages, but the article was way longer. Page charges for those excess pages rang up something like $1500. And not one of us had the funds to spare. It almost stopped there, but Michael Turelli offered to pay the APCs. None of us were Turelli students. He's just that kind of generous*. We accepted his offer, the paper was published, and it became my most cited article by a long shot. So, I am very sensitive to the barriers that APCs impose on unfunded authors. This is why I am such a proponent of mixed publishing models (like The American Naturalist uses), where people can opt in to pay for Open Access, or can pay less for regular page charges, or can get waivers if they are members ($20 for students!) who lack funds for APCs. That's a powerfully flexible model. But, one that is threatened by the EU's Plan S.
*Turelli had one condition: that we list him in the acknowledgements of our paper using a humorous phrase that he specified. All very interesting. I personally am a very visual/aesthetic in my mental processing, and find pre-typesetting manuscripts very difficult and unpleasant to read. A properly typeset manuscript is like a little gem, and it gives me joy to read it (and it's not just about pleasure – I think I can read typeset manuscripts more quickly, with higher comprehension and retention). Yes, it costs money, but I think science is not just about making discoveries, but about presenting those discoveries to the world in a comprehensible and compelling manner. Science is opaque and inscrutable enough without adding more barriers to understanding. And yes, maybe authors could attempt to do their own copyediting and typesetting, but let's be realistic – the end result would very often be a "dog's dinner", as the Brits say. This is an interesting read and thanks for all the details of you payment history. I am left a bit confused though. APC commonly refers to articles processing charges, a fee paid to the publishers to make your articles immediately open access (mostly with an open license). Here you mention article page charges, that also exist, but are almost exclusive applied to closed access articles that are above a certain length. I know there are also some open access publishers that charge per page, but those are exceptions. So I guess my question would be: are the numbers you provided fees you paid to make publish articles open access or to publish articles that were over a certain length? 1. is the main problem about "paying or not" for copyediting or whether publishers are overcharging for this service? I'm just thinking of the profit levels of the scientific publishing sector, it looks like the question is not just about whether we want or not to pay skilled copyeditors but whether we are charged a fair price for that. If the price is not fair, then it is very understandable to go straight to preprints - it would be the only reasonable thing to do (collectively) to actually force the prices down. 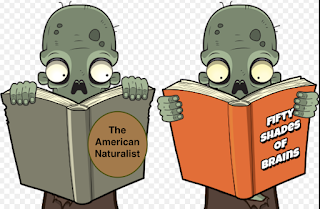 2. is the AmNat model such a "mixed publishing model"? Or more generally, is AmNat such a friendly journal regarding preprints? In ecology/evolution, it is currently the only journal that completely misunderstood the PCI initiative and presents it as an overlay journal (instead of a recommendation service) to justify not accepting any preprint recommended there. 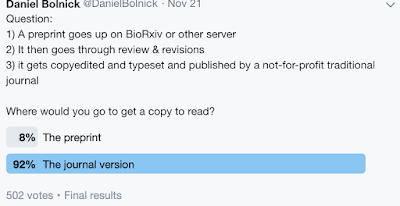 I'm very disappointed by this decision, to tell the truth, and it is not going to promote peace between proponents of public preprint repositories and AmNat... Why would you consider preprints differently if others had a look at them before and wrote some text explaining why they liked it? Am I an OLD prof?